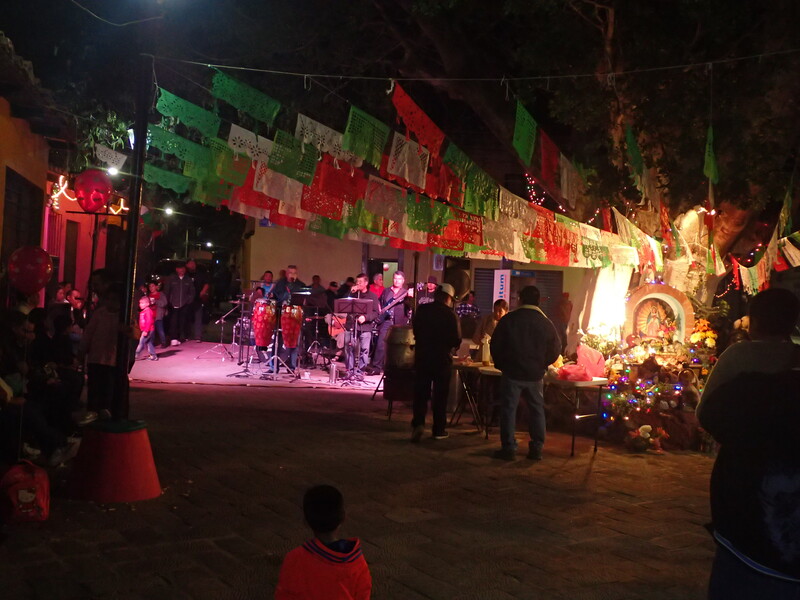 We loved the Virgin of Guadalupe fiesta. 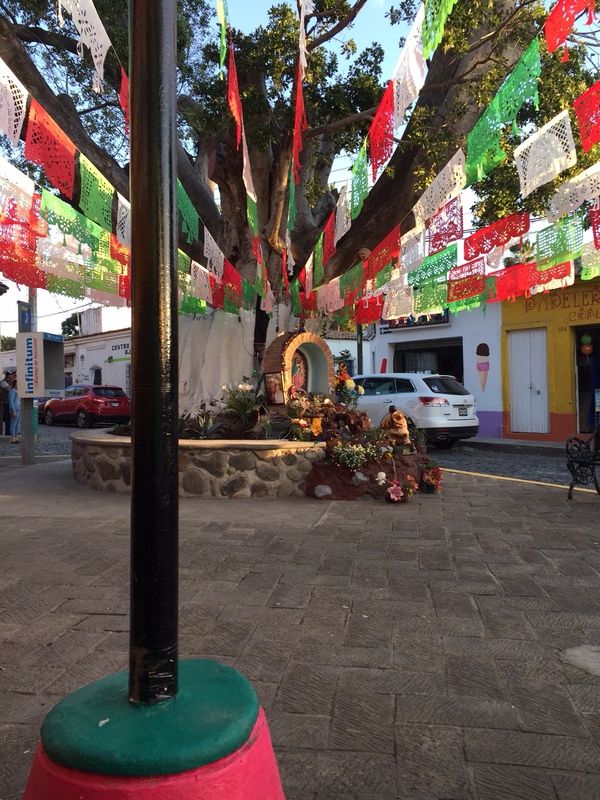 We live a few blocks away from where the church honoring La Nuestra Señora de Guadalupe is located, an area called Seis Esquinas (six corners). 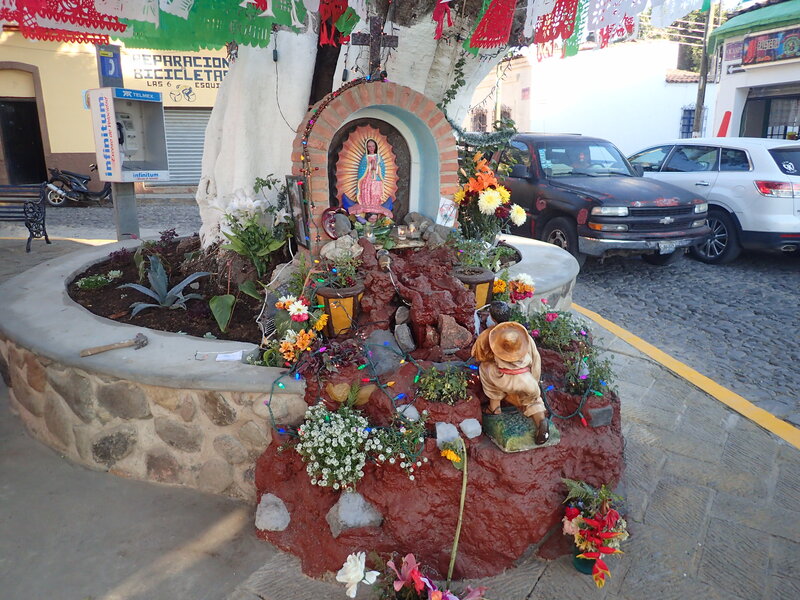 At the place where the streets come together to form the six corners is a tiny plaza with a big tree, a shrine for Nuestra Señora and some benches. The benches, shrine, and many of the surrounding shops got fresh coats of paint in the few days before the fiesta. The shrine was decorated with flowers and holiday lights. 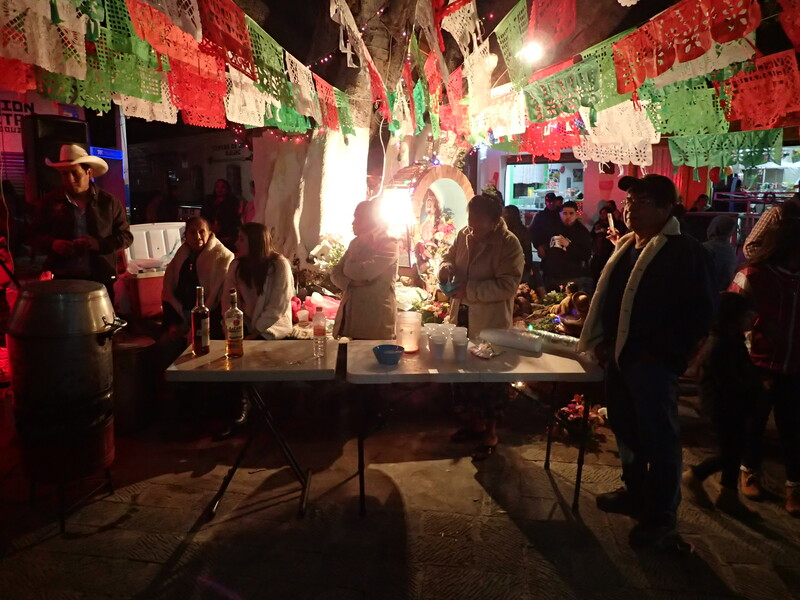 Altars could be found on the neighbor streets as well, outside of stores and homes, decorated lovingly with lights, candles, flowers, noche buena plants (poinsettias). During the day, we saw food booths setting up on the street. (I was fortunate to hit up the dessert table for some tres leches cake before he sold out.) 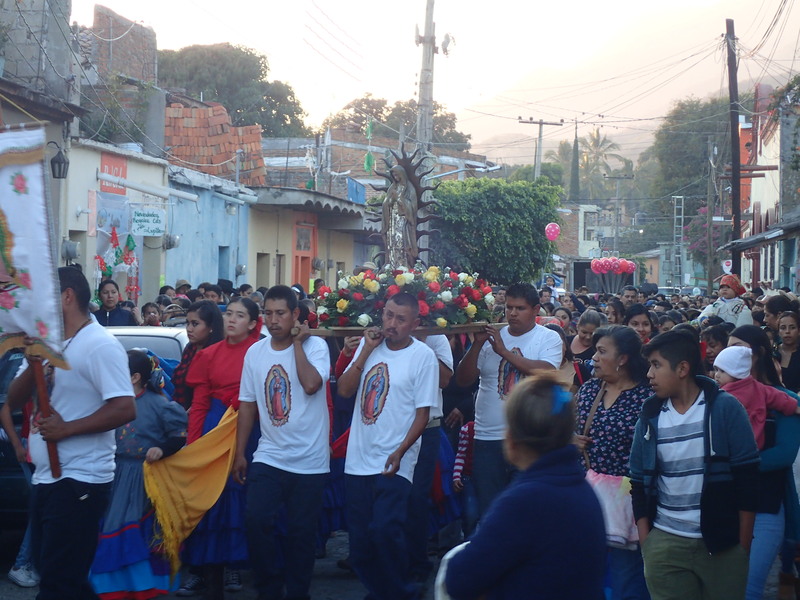 Late afternoon, a procession from the church went around town and then returned. 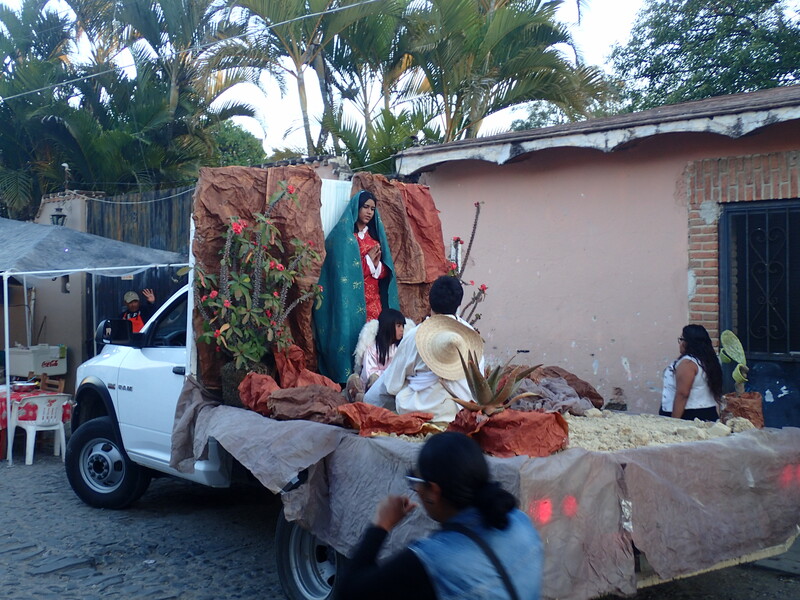 The procession was led by small sharp-dressed children forming a drum and bugle corps and also featured: dancers; several pick-up truck floats featuring people acting out the first vision of Nuestra Señora to Juan Diego in 1531; the icon from the church carried on a bower of flowers; and a band — all of this followed by lots of folks. 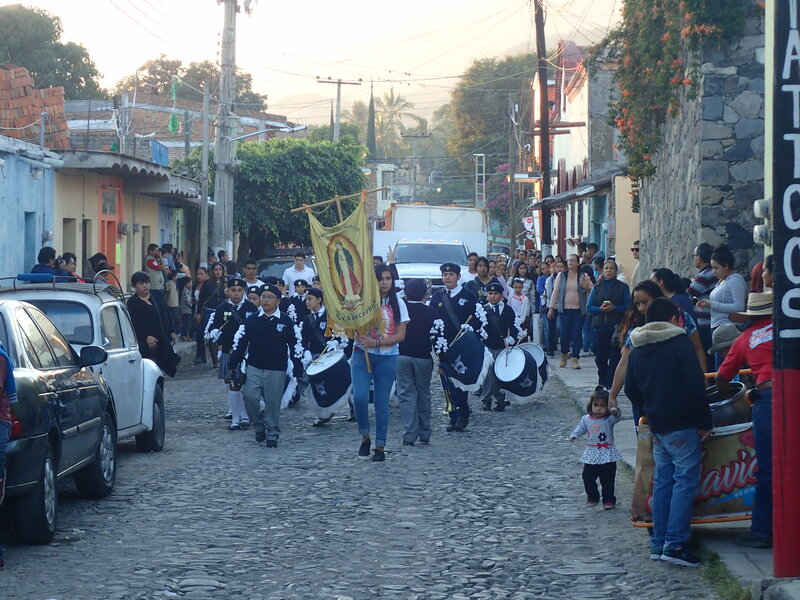 Guys rang the church bells and some of the procession members set off sky rockets, and the drum and bugle corps led the way into the church grounds. Mariachi bands took turns over course of the evening, serenading Nuestra Señora. Outside the church, toy and balloon (yes, balloons with the Virgin’s iconic image) vendors set up kiosks among the food and drink sellers. A truck arrived containing the parts and pieces of what would become the fireworks castillo and a team of men unloaded it and started to assemble it in the street. 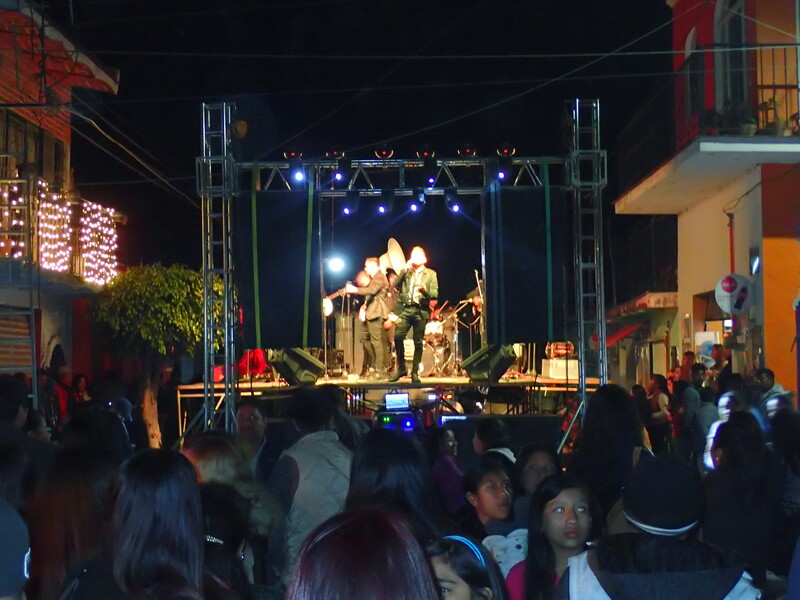 Finishing touches were put on a bandstand in a nearby intersection and someone climbed a ladder to hook the lights and band equipment into the power grid. An entrepreneur put up a “Baños 5 pesos” sign and started selling restroom access, for which we were grateful. As it got dark, a band started in the plaza. The local mini-super set up a cooler outside to sell beer and bottles of tequila. A guy with a table and cooler near the bandstand sold cocktails made to order in plastic cups (I can vouch for the tequila and mineral water combo). 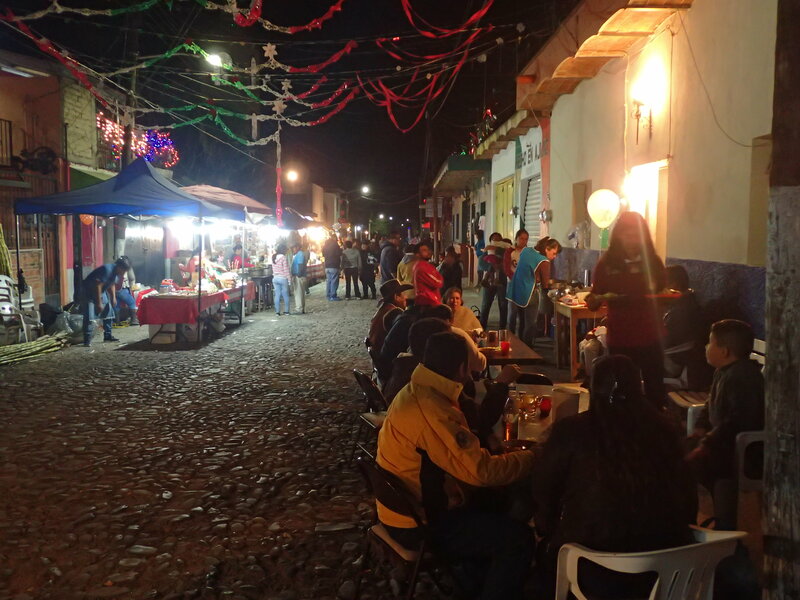 On the plaza, a propane cooker heated up a large metal keg full of canela (cinnamon tea), which was served free of charge with bowls of sugar and a few bottles of booze for the recipient to use to customize his or her beverage. Given the night chill, the steamy canela hit the spot. A man on a horse arrived wearing a poncho and boots with spurs and started the dancing. Soon, the plaza was filled and we were happy to join in. The band was great. Folks were handing out sparkly pompoms on sticks and the type of long balloons that clowns use to twist into animals. Very fun and festive indeed! The band quit, but shouts of “otra!” compelled them to do one more song — the Spanish version of “Jailhouse Rock.” It’s much more fun in Spanish! The musicians on the bandstand were going strong by this point, the crowd thick, everyone eating, drinking, and making merry. These were younger guys, all dressed sharp in matching black skinny pants and jackets, playing more modern music than the cumbia and salsa we had enjoyed at the plaza. The fireworks team was still working on the castillo when we left about 12:30 a.m., long past our usual bedtime. We could hear the band and fireworks as we drifted to sleep. A big thank you to the Seis Esquinas neighbors for allowing these two foreigners to party with you! Party on! This entry was posted in Mexico and tagged Ajijic, Seis Esquinas, Virgin of Guadalupe on December 17, 2017 by czelazek.